Male pekins are called drakes while females are called hens. Ducks lay eggs whether or not they have mated but these eggs are infertile and will not hatch into ducklings. Pekin ducks are the most popular pet duck in the United States. Though domestication has made them healthier and friendlier, it has also eliminated their brooding instinct. Most pekin ducks will not brood their own eggs, so duck owners must be prepared to incubate the eggs. Duck owners should think carefully before breeding ducks. Ducklings grow into adults who need space, healthcare, food and socialization. 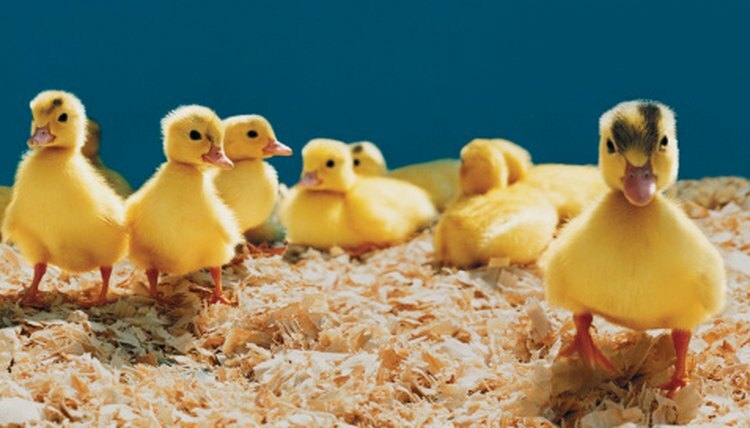 It can be challenging to find good homes for ducklings, so duck breeders should not assume they will be able to sell or re-home ducklings. Group one drake with four to five hens. When multiple males are grouped with fertile females, they may fight, but one male can inseminate several females. Pekins should be bred at 7 or 8 months old. Breeding too early or too late can cause infertile eggs and unhealthy ducklings. Ducks are most likely to breed in early spring, sometime between February and May depending upon where you live. Provide your hen with a nesting area. Pekins will lay their eggs anywhere, but a well-designed nesting box will encourage them to lay eggs in the box. Put the box in a quiet, secluded area of the duck enclosure or yard. A large wood or rubber container will make an excellent nesting box. Drill or cut a hole in the front -- not the top -- of the box that is large enough for your hen to enter. Put a flap of fabric over the entrance on the inside of the nesting box. This will help your duck feel secure while laying her eggs. Fill the nesting box with peat moss or vermiculite, which can help stimulate nesting behaviors. Collect the eggs and place them in an incubator. Be careful not to turn or shake them while moving them. The eggs should be partially covered by moist vermiculite or peat moss, and the incubation temperature should be 99.5 degrees. Eggs normally hatch after 28 days. At 24 days, lower the temperature of the incubator to about 95 degrees. Feed the ducklings a commercial duckling food. Chick food is an acceptable substitute if you can't find duckling food. Never allow ducklings to swim in water unsupervised. Their feathers aren't thick enough yet for competent swimming and they can easily drown.